This is the second book that our book club has discussed. Previously, we reviewed The Obelisk Gate. Becky Chamber’s sophomore effort is a book of hidden depths. The more we talked about this book, the more we found to like in it. Although it appears at first to be a relatively simple work that might have been too juvenile for serious consideration, A Closed And Common Orbit’s cleverly paralleled storylines and focus on well-developed characters make it a serious contender for our votes. 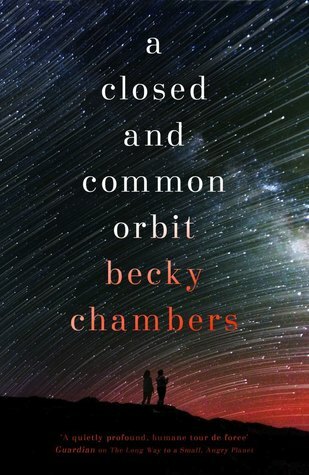 Set as they are in the same universe, it is hard to discuss A Closed And Common Orbit without comparing it to Chambers’ first novel Long Way To A Small And Angry Planet. Leading off from Chamber’s debut novel, this book explores the lives of two incidental characters from the earlier work, but does not continue any overarching plot. It’s pleasant to note that A Closed And Common Orbit is enriched by, but was not dependent on, the author’s previous book. Those in our book club who had not read the previous book did not feel like they were at a disadvantage. While themes of fitting in and finding a family of accepting friends recur throughout the two novels, the first was a fast-paced (if uneven) adventure novel, while the more recent book is a coming of age story. That journey into adulthood is what Chambers does so well in this book. 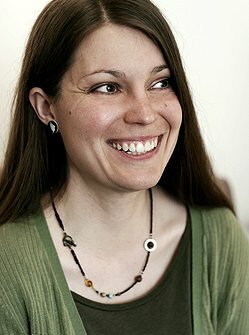 Of the two parallel stories being told in the book, we felt that the one focusing on the character of Jane (AKA Pepper) is the most engaging. Some felt her observations are written with a significant level of insight into child psychology. But the story of Sidra — a shipboard AI who has been installed into a humanoid body — counterpoints the first narrative well. While Jane’s struggles are about physical and emotional survival, Sidra’s challenges are about identity and finding a social space. Sidra’s confusion and dismorphia were well imagined, which left us with a lot to think about. There are no grand statements here, just quiet and human observations about coming of age without a ‘traditional’ support system, and about finding a way to fit in. This is a split timeline tale of abandonment, friendship, acceptance and hope. This is not a book about saving the galaxy, fighting a war, or stopping some great evil — the stakes are entirely human, and perhaps this is one of the book’s greatest strengths. It’s a human-scale story to which many will relate. The prose is clear, crisp, brisk, informal and modern. Chambers has her own voice, but is not too in love with the sound it. This is simply written, without navelgazing or overly precious phrases. This is a novel that one can hand to a friend who does not read science fiction, and expect them to enjoy it. There's a lot of value in that. Amongst a bevvy of nominees in which the narratives are epic and bombastic, the humanity of A Closed And Common Orbit stands out. Amongst a group books whose prose is opaque and whose language is obfuscatory, the clarity and readability of A Closed And Common Orbit stands out. Nobody in our group disliked the book — which is rare. And some of the members of our club are likely to put this at or near the top of their Hugo ballot.